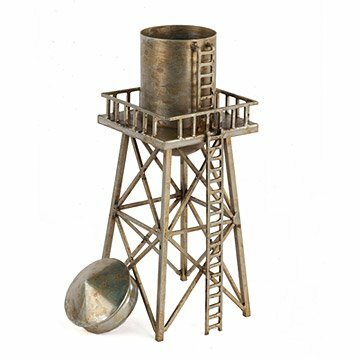 Bring a rustic touch of industrial intrigue to your indoor decor with this water tower sculpture. Bring a rustic touch of industrial intrigue to your indoor decor with this water tower sculpture. Evocative of both rural water supplies and urban rooftop tanks, this nostalgic structure makes a perfect accent for a bookshelf, entry table, or sideboard. Made from hand-welded steel, the sturdy design is also a functional receptacle for keys, coins, and other small items. Made in India. Used as a gift for someone who has everything. This will be an 11th year anniversary gift. Each year, I try to find some type of sculpture. This one is perfect to engrave a message as if you had painted it on the local water tower. It will make a pleasant addition to the living area. The Manhattan cityscape I see from my high rise apartment window includes views of some 29 water towers, relics of a past era in the big city. Instead of covering up the view with shades and curtains, I decided to glory in it with a water tower of my own. Absolutely love this water tower! It's perfect for our living room mantel, great size and weight. Excillent quality and a great statement piece. Recommend for sure! We used it as part of a retirement gift for our City's Architect. We work in a municipality & it was a perfect memento for this occasion. Thank you!